I have just stumbled upon this absolute gem of a webpage, which I cannot believe I have not seen before! 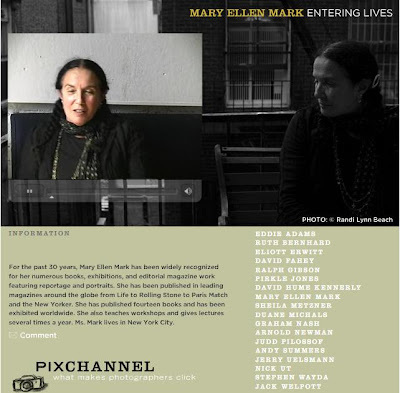 Pix Channel is the brainchild of Randi Lynn Beach who has ever so generously compiled this wonderful series of her interviews with various photographers and shared it with the online photography community for us all to pore over. Photography on the web at the moment is kind of like a garden bursting into life, there is so much brilliant stuff sprouting up everywhere! 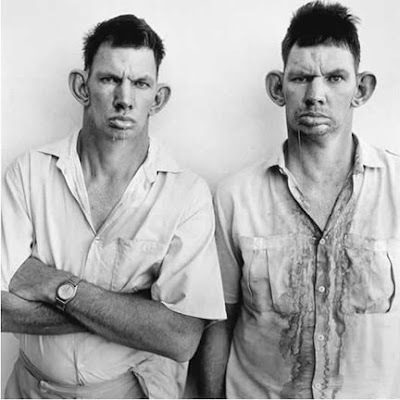 The former Arts Editor at the Portland Mercury and frequent contributor to numerous publications about art and photography, Chas Bowie will be presenting his slide-show gallery talk in conjunction with the closing of Roger Ballen´s exhibition this Saturday at Quality Pictures Contemporary Art. If the content of his amazing blog on photography, That's a Negative is anything to go by, this should make for a thoroughly enjoyable evening. Given that it is free there really is no excuse to miss this one if you are a Portland resident so RSVP to info@qpca.com as space is limited. For those of you like me who sadly won´t be able to go, make sure you stop by his aforementioned blog, That´s a Negative which features a great selection of meaty critical essays and photography reviews to sink your teeth into. It really is such a great online publication that it must be added to your reader if, for some strange reason, it isn´t already! 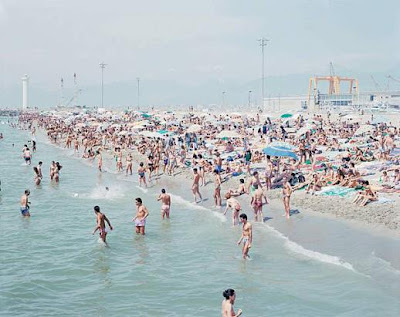 Summer is now truly upon us; people are starting to flock to the beach, offering up their bodies to sun worship and self abandonment, and the Italian photographer Massimo Vitali evokes the great times that lie ahead with his beach scenes currently on display at Galeria Senda. Within his huge panoramas, masses of people crammed into public spaces have been frozen in time as they try to relax, play or pursue other idle leisure activities. What is truly remarkable about these images is not only the tremendous sense of scale or peculiar use of perspective, but moreover the way in which the camera´s crisp clarity renders crowds of tourists with such exacting detail that every person is like a single candid portrait. Viewing these mural size prints, our eyes move in and shift from one figure to the next, prowling photographs that bustles with life and action, their visual volume almost overwhelming. There is so much happening here, yet at the same time nothing is really going on at all; perhaps this is what is most captivating about Massimo Vitali´s work. The hundreds of mini stories being played out in the images arouse our curiosity; our minds have to inhabit the place with our own imagined narratives in an attempt to explain these random little moments. In the tradition typical of the gifted photographer, Massimo Vitali is able to capture scenes banal enough for us all to recognise while imparting his oblique vision through the very special qualities of his photographic imagery. The debate over the similarities and differences between photography and cinema is as old as the two media themselves and while this fascinating exhibition currently on show at CCCB, Barcelona is the latest in a long list to explore the relationship between the two disciplines it is, much to its credit, a lot more original than many of its counterparts. Magnum have teamed up with Cinémathèque Française and invited ten of their photographers to produce original works in response to specific film (or a single scene within the film), filmmaker, period or style and in this way demonstrates the influence of cinema in their own imagery. The results are as wonderfully eclectic as the different generations and schools of documentary photography that the photographers represent. 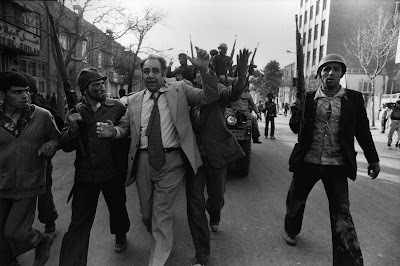 For example Abbas juxtaposes clips from Robert Rosselllini´s Paisà, (1946) against his own black and white photographs of violent and convulsive scenes of civil war that erupted on the streets across Tehran between 1978 and 1980 during the Iranian revolution. 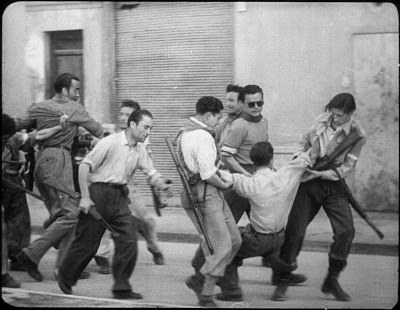 Rioting, demonstrations, arrests, executed bodies and the like are depicted through a series of 18 images while two large format projections of Rossellini´s film run simultaneously, the desired effect of which is to draw parallels between the similar aesthetic approaches and themes of heroism, nationalism and war. Essentially they are bound by brutal realism. Utterly different in tone and technique is Antoine d´ Agata´s private autobiographical diary of his stay in Tokyo inspired by Oshima´s Empire of the Senses. His photos are not hung, but take the form of a film called Aka Ana, in which he stars as the main character who is seen with a lover. Far from being sexually explicit, the way their bodies glide over one another is in fact more sensual than anything, and the close up camera shots and disorientating perspectives make many of the body parts hard to discern. The design of the video installation itself is such that it seamlessly interweaves still photographs with moving images, so the boundary between the two works becomes blurred. Elsewhere, Alec Soth pays homage to Wim Wender´s cult classic Kings Of The Road(1979) that was based on the story of a wonderer who fixed film projectors for a living in a time when cinemas were rapidly disappearing in the German Federal Republic. 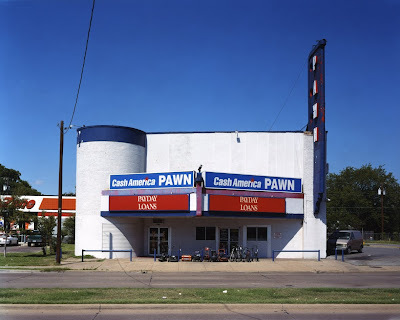 Soth is a renown photographer of modern American life who often reveals striking yet vacuous and disturbing aspects of his country; for this project, he travelled across Texas taking pictures of thirty six abandoned movie theatres and one funeral parlour to follow in the footsteps of this film that profoundly marked his teenage years. Each pairing is so unique in this exhibition that the viewer never tires nor do they grow complacent since there is no formula, no repetition. There are, instead, many different slices of reality on display, showing how cinema left an imprint on these photographer´s psyche and, in turn, how this imprint manifested in their work. Have a look at this short clip on Stephen Shore wherein he eloquently explains his thought processes when taking pictures, how the medium can be used to explore perception, the way in which his visual problem solving has changed over the years, the lessons learned from watching Andy Warhol work and even his views on cropping. It´s nice this. Berlin based photographer, Thorsten Kirchoff got in touch a little while back and presented his body of work called Alibi that immediately struck a chord with me. This collection of eerie and enigmatic photographs are a brilliant example of the transformative potential of our everyday environment. Silent and secret, they suggest notions of interlude and aftermath since we get the feeling that something is about to appear in or has has just left the image. Another reality slowly unfolds itself in Thorsten´s solitary ballad. The spaces he has photographed are often lacking in references to the formal bases of the city: history and geography are abolished. Perception roams freely and it is as though these images have sprung from the dark recesses of our imaginations and fantasies. He is clearly more interested in the atmosphere rather than any one particular object. 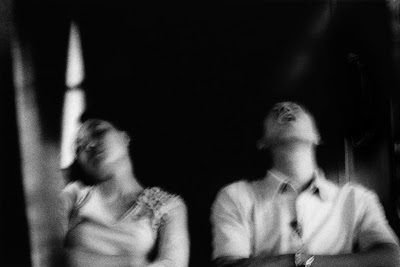 Out of focus, grainy, slanted, full of movement and with sharp contrasts, these photographs are the result of a rapid gaze and weaken the idea of the place by the ephemeral way it is recorded. "The pictures in the series, Alibi appear to be far removed from reality and present in a disturbing way. 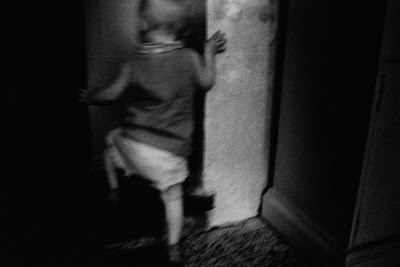 Time and place seem to disappear-the photographer moves through timeless and undefinable spaces. 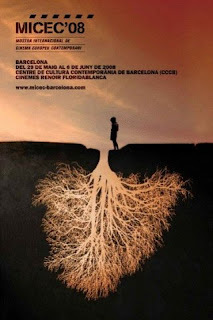 A space of interpretation as wide as possible emerges and the beholder is required to make up his or her own stories." Thorsten Kirchhoff was born in Thuine, Germany (1973). He studied Publishing in Leipzig and Photography at Fas in Berlin. He has worked as a book designer for different publishing houses including Powerhouse Books, New York and was also a member of Neonplus, a collective of photographers in Berlin. 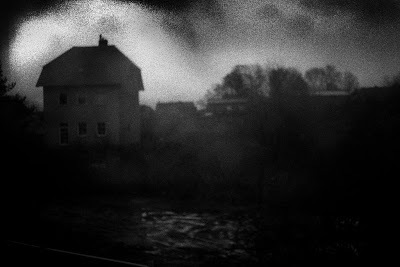 His work has been the subject of numerous exhibitions at the Konika-Minolta Gallery (Tokyo, Japan), Prg (Bern, Switzerland),Museum Neukolln, Fas and Neonplus (all Berlin, Germany), Phototrinnale Hamburg 2008 (Hamburg, Germany), Photomonth Crakow (Crakow, Poland) and more recently at the Inaugural New York Photo Festival 08 (New York,USA). This work was passed my way a few days ago for which I am most grateful. 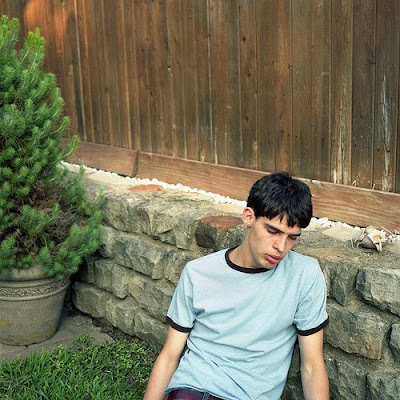 It is titled, Odd Sympathy and was produced by a very precocious young talent called Alana Celii who quite rightfully won the inaugural 2008 New York Photo Festival Student Award. "I would like to re-involve myself with the people who are, or who have become a part of my family. I've been inspired by the aesthetics of painting, and would like to reinterpret the poses and iconography through a contemporary lens. As humans, we collect tangible and intangible artifacts to voluntarily remember places and times. However, it is often the most nondescript cues that trigger recollections of the past without conscious effort. Through photographing the interior spaces of my family's homes, I want to address the ties between memory and collecting. I am curious about the value and significance we give to objects, and how that value does not always transcend our personal and cultural differences. In addition to the interiors, I want to re-address the landscapes of my childhood by photographing the spaces I grew-up in." Alana Celii was born in Chicago in 1986. She is currently pursuing her BFA from Parsons School of Design, and lives in Brooklyn. Her work has been featured in publications such as A Field Guide to the North American Family, Hijacked, Canteen Magazine, Beautiful/Decay Anthology, Ruby Mag and Look-Look magazine. She has exhibited work in group shows in New York, Berlin, Los Angeles, London, Sydney and Dallas. I expect we will be hearing a lot more from her in the future. Ian Parry Scholarship-Open for Entries! If success begets success then this years Ian Parry Scholarship promises to be another brilliant event and will surely root out some fine talent. Ian Parry was a photojournalist who died whilst on assignment for the Sunday Times during the Romanian revolution in 1989. He was just 24 years old. The Scholarship was set up by Aidan Sullivan, then picture editor of the Sunday Times and Ian’s friends and family in order to build something positive from such a tragic death. Each year a competition is held for photographers who are either attending a full-time recognised photography course or who are 24 years old and under. Entrants must submit a digital portfolio of their work to their FTP and a brief synopsis of a project they would undertake if they won the award. There are, of course,some hefty cash prizes up for grabs.Currently the prize is £3,000 towards their assignment and £500 to those awarded highly commended and commended. As you can imagine this is a significant prize for a photographer and coupled with the continued support of The Sunday Times Magazine, which publishes the winner's work, the scholarship provides an excellent launch into a professional photography career. Year after year, the award has highlighted the work of some of the industry’s finest emerging talent, all of whom have progressed into professional careers and still support the award. A first this year is that World Press Photo will automatically accept the winner onto their final list of nominees for the Joop Swart Masterclass in Amsterdam. This is because of so many of our previous winners having attended this prestigious event in recent years. The 2008 jury are: Don McCullin Patron, Jonas Bendiksen/Magnum Photos & 2002 Winner, Tom Stoddart Getty Images, Tony Chambers Editor-in-Chief Wallpaper* magazine, Cheryl Newman Photography Director Saturday Telegraph magazine, John Downing Trustee, Steve Blogg Getty Images, Stephen Reid Art Director Sunday Times magazine and Ian’s family. Judging will be held on the 1st July at the Frontline Club in London. In true time honoured fashion, the extremely popular and well-attended print exhibition will take place in London at the Getty Images Gallery. The exhibition will run from the 7th August to the 16th August 2008. 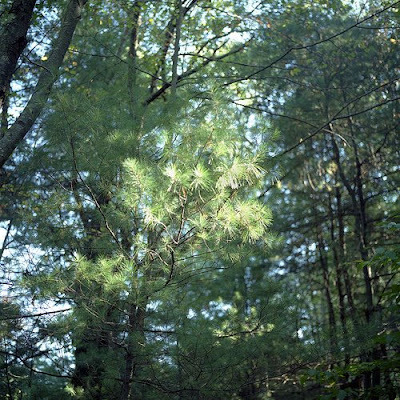 New York based photographer/curator,Cara Phillips recently got in touch with me much to my delight since I am big fan of both her photoblog, Ground Glass and her personal work, in particular her cosmetic surgery project, Poignant Longings For Beauty, a small sample of which can be seen here below. "America's beauty culture is a complex and pervasive phenomenon. 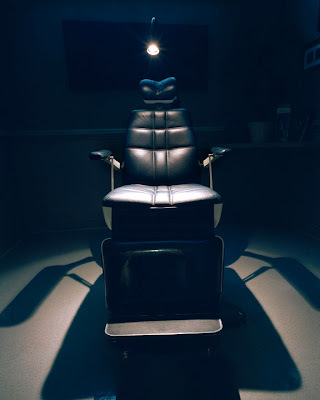 Its scope and power can be found in the many cyberspace forums devoted to the subject. On these anonymous message boards patients share their results, questions, and feelings. This easy access to information has triggered the rapid growth of the industry. In 2004, 12 million Americans had a cosmetic procedure and the numbers continue to grow. 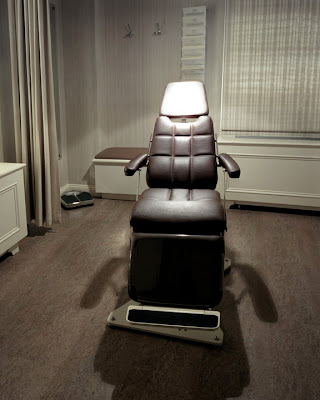 Today there is a never-ending array of tools and machines to make us beautiful. 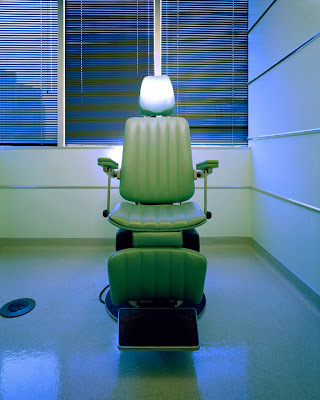 Patients look in the offices of Cosmetic Surgeons for the promise of happiness. Instead they often discover their own fears, self-loathing and anxieties. The American Society of Plastic Surgeon's website states that, "Even a small change on the outside can create an extraordinary change on the inside, allowing an individual's self-confidence to flourish." The message is clear - we can now reshape our characters with a scalpel or a syringe. This body of work coincides with a long and personal struggle with body and self esteem issues. But in photographing these doctor's offices, I have been able to conquer many of my inner demons and in the words of Susan Sontag make "familiar things small, abstract, strange and much farther away." Last week Cara also launched Woman in Photography, an arts initiative which she co-curates with her pal Amy Elkins. WIPNYC showcases exciting work from female artists in the form of solo exhibitions that will take place every other Tuesday across different venues in New York. Their next show is on June 17th. Well worth a visit me thinks. These images were kindly sent to me by Sarah Ewing on behalf of Nick Turpin. 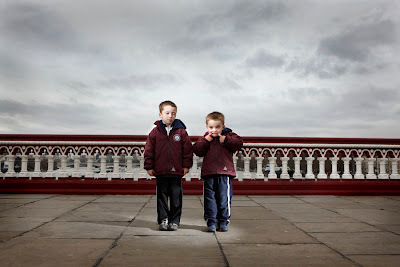 They are culled from his on going project, The Bridge, an interesting visual survey of the users of Blackfriars Bridge, London. "I have decided to meet the actors, selecting interesting strangers in the streets and isolating them from the crowd for a few minutes in order to shine my interrogating lights on them. 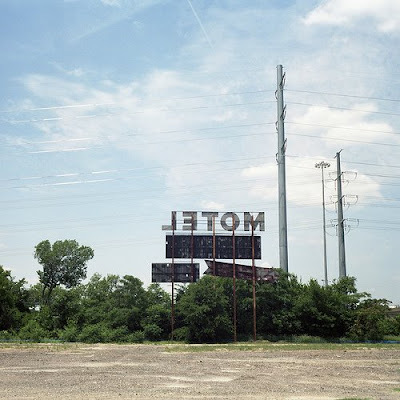 Each series of pictures is a social survey, a photographic census of a place or a type. The Bridge series is made on a bridge over London's river Thames, an exposed location that gives no cover to my subjects who find themselves isolated like microbes on a microscope slide. 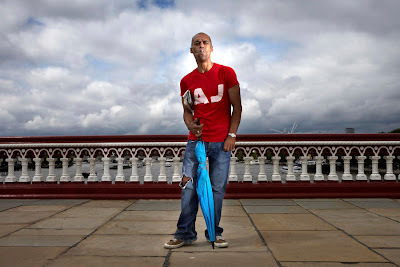 We don't expect to be singled out in a city the size of London, I am sure everyone I approach thinks they are about to be mugged and in a way they are." 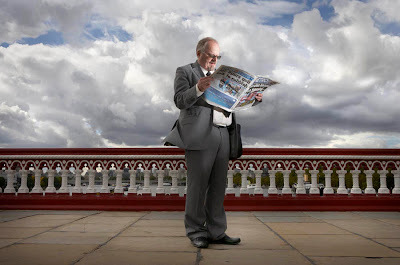 Nick Turpin began his photography career in 1990, at the age of 21, by landing a job as a staff photographer for The Independent. Since 1997 he has been shooting design and advertising projects for clients around the world including Toyota, Jaguar, Land Rover, VW, IBM, Barclays Bank, Vodafone and Sony. 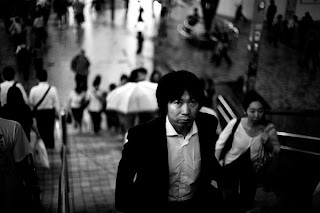 In 2000 he founded the international street photographers group iN-PUBLIC which has led to lecturing and teaching street photography at London's Tate Modern, Yale School of Art and on TV. Having featured Olaf Otto Becker´s body of work, Broken Line in the first issue of 1000 Words I thought it would be appropriate to show this nice little documentary which comes courtesy of the extremely talented team over at Daylight Magazine. Great work guys. I´m loving this! Opening next week is an exhibition of the work of a young French photographer called Matthieu Casimiri which will run from 9th of June to 13th of July 2008 at Galerie Le Lucernaire, Paris 6eme. 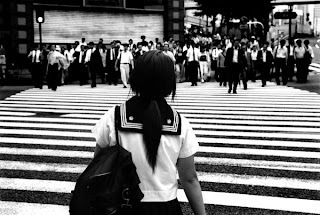 Featuring work from his series, Asia: Urban Depression, his photographs capture the alienation and loneliness that can be seen as a by product of city living. The artist looks for signs of humanity within the metropolis and its de-humanizing urban areas to explore the multiple narratives emerging around this notion of collective space. 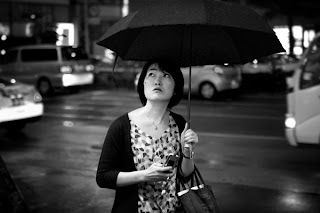 Very much in the vein of street photography, Casamiri has skillfully paused the constrant stream of life as it passes us by and described the great urban dramas that take place. 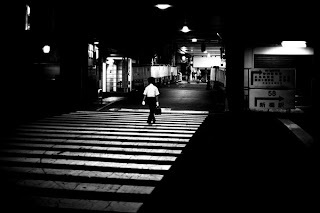 The subjects he photographs are anonymous beings: isolated people who walk, wait or dissappear into the distance, swallowed by a dense darkness which the particular atmosphere created in these photos makes possible. 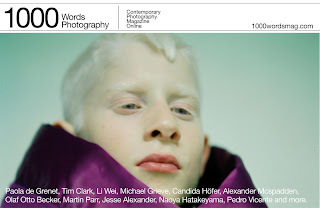 I am delighted to announce the launch of the eagerly awaited 1000 Words Photography Magazine! In this debut issue, we transport you to the colder climes of Greenland via Olaf Otto Becker´s images from Broken Line, an awe inspiring project for which the photographer travelled along Greenland´s coastline in a rubber dinghy and documented it´s desolate landscape. Greenland´s state of flux has made it the point on the world map which has become the barometer for global climatic change. His cleverly informed and influenced topographic photographs imply that there is no such thing as an `untouched landscape´ anymore, that every natural landscape is affected by man. Of his work Becker says, “The absence of man in my photographs leads us to think about man.” In line with this idea we take a look at Candida Hoffer´s new series, In Portugal whose photographs of interior spaces from various cultural institutions also betray a constant human presence through the traces left behind and the structures created. Elsewhere, the prolific Chinese artist, Li Wei quite literally comes crashing onto the scene with his performance based photography. His digitally manipulated images show the artist´s head thrust into the earth while his body remains rigidly vertical like some missile that has plummeted out of the sky. Li Wei´s work strikes a chord with China´s recent history and comments on the country´s contemporary social conditions. With the Olympic Games lying just around the corner we all know that it is very important for China to portray a positive image to the rest of the world given its appalling human rights record and to also rekindle a sense of national solidarity in the aftermath of the terrible earthquake that has destroyed the lives of so many people. Working on a less political level, the Italian born, Barcelona based photographer, Paola de Grenet wrestles with the challenges of representing `the other´ through her extraordinary body of work that portrays the community living in Aicuña, a tiny village in the La Rioja region of Argentina that is known for having the highest rate of albinism in the world. We also look at the world through the eyes of another documentary photographer, Martin Parr of the legendary Magnum agency. His ongoing project Luxury, depicts the nouveau rich parading the insignia of their wealth as they swan around at fashions show, art fairs and horse races in Dubai, Durban and Moscow. Parr´s trademark themes of recreational activity, consumerism, mass tourism and globalisation coupled by his signature style that blends peculiar motifs with garish colours and quirky perspectives have gained him a world renown reputation as a master of social realism. Finally, we turn our attention to Naoya Hatakeyama´s photographs in Slow Glass which demonstrate a totally different use of the camera. The soft, defocused images taken in rainy Milton Keynes at night through panels of fogged glass reveal the painterly effects of light and shade, form and colour, line and perspective that are instrumental to the `all over´ composition. These deceptively simple yet inwardly complex pictures challenge the notion that crisp, detailed images are what photographers should strive for whilst simultaneously re-evaluating the medium and its relationship to visual perception. Enjoy the photography and please feel free to give us your feedback, we would love to hear what you think!